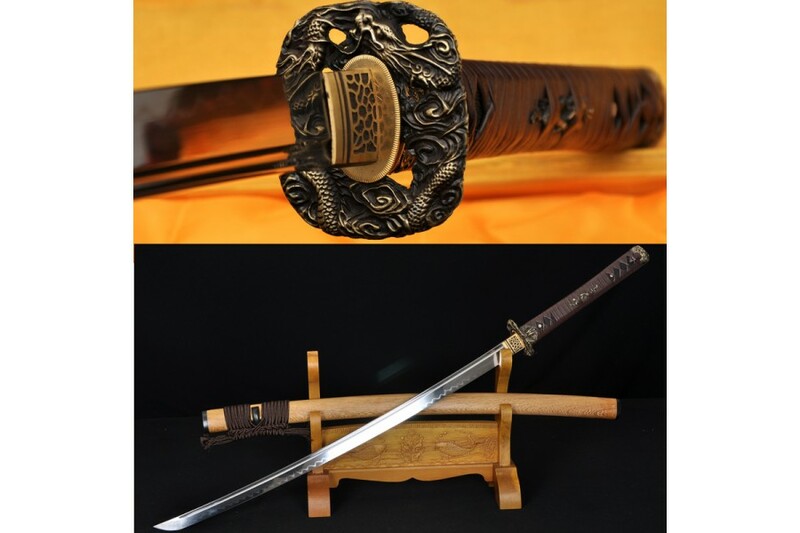 This KATANA is hand forged and hand sharpened using Japanese methods to create a perfect blade. The blade of the sword has been Full hand forged, hand polished and hand sharpened. The blade was made of 1095 high carbon steel, and it has been laminated in a Maru style. The blade comes with full tang and a chu-kissaki. The steel has been throughly refined and tempered, a special clay is applied to the blade by hand, using a thin covering near the edge and a thicker layer over the rest of the blade. This results in a relatively quicker cooling of the edge during quenching, producing a hard edge and softer back. The beautiful real hamon on the blade is also result from the differential cooling of the blade (quenching and tempering). Blade is fully functional and sharp. It has been sharpened by the traditional 13 stage sharpening work. Test cutting proved that it can be used for test cutting such as bamboo/ tatami mats/ water bottles. The Dragon design Tsuba (guard) of the sword is made of alloy. The Habaki (blade collar) is a one piece brass construction. Two Seppas (spacer) secure the Tsuba. The Tsuka(handle) of the sword has been constructed from black genuine Ray skin Samegawa wrapped by brown leather ito in katatemaki style and secured by two bamboo Mekugi(pins). The katana comes with a natural hualee wood Saya. Brown synthetic Sage-O has been tied around the bright copper Kurigaga (knob) of the scabbard. the Koiguchi has been hardened. This is a sharpened, super, truly battle ready Samurai sword very suitable for iaido and kendo superior. it is also allows you to make a collection of realistic, yet beautiful samurai sword, or to present one to your friend. Don't miss such a chance! Comes with a free sword bag and certificate of authenticity. --- Please Select --- Cotton: Brown (C02) Cotton: Black (C03) Silk: Coffe (C07) Silk: Red (C10) Silk: Dark Green (C13) Silk: Dark Blue (C14) Silk: Black (C15) Silk: Gold (C17) -Other: please write a note in text box below. --- Please Select --- S01: Green S02: Blue S03: White S04: Black/Red S05: Deep Blue with speckle S06: Deep red with speckle S07: Black matt finish S08: Red S10: Glossy Black S11: Reddish brown with black speckle S12: Black with red threadiness S15: White with black fumy S16: Black/white S22: Purplish red+bull horn (+$35.00) S24: Red rayskin wrapped saya (+$45.00) S25: Black rayskin wrapped saya (+$45.00) S26: Green rayskin wrapped saya (+$45.00) S28: Brown leather wrapped saya with strap (+$45.00) S29: Black leather wrapped saya with strap (+$45.00) -Other: please write a note in text box below. This katana featured a hand forged damascus steel blade. The blade of the sword has been hand forged using the ancient method of sword making. Full hand forged, hand polished and hand sharpened. High Carbon Steel are folded 13 times creating 8196 layers for superior strength and flexibility. the visible tenuous undulating grain on the blade was resulted from folded repeatedly during forging. The whole blade was hardened by oil tempered. The blade is hand polished and hand sharpened by 12 steps w.. This japanese samurai sword katana has been hand polished and hand sharpened by hanbon forge. The full tang blade has been constructed from 1095 high carbon steel. The steel has been throughly refined and tempered, A special clay is applied to the blade by hand, using a thin covering near the edge and a thicker layer over the rest of the blade. This results in a relatively quicker cooling of the edge during quenching, producing a hard edge and softer back. the beautiful real hamon on the blade i.. This sword is hand forged and hand sharpened used Japanese traditional method. The sword is clay tempered 1095 steel 1.26" SORI blade. The beautiful real hamon on the blade is result of the differential cooling of the blade (quenching and tempering). The blade is hand polished created a mirror effect. It is sharp enough to cut through fresh bamboos, small trees, straw mats, slice paper. Two bamboo Mekugi(pegs) secure the tang of the blade. The tsuba(guard) is made of iron. The wooden tsuka(handl.. This Katana sword is made of 1095 high carbon steel which inherits the hardness and the toughness of the Carbon Steel material. The Sword is intended to regular use and very frequent Dojo cuts. The tang is double pinned with bamboo mekugi. The handle core is made of hard wood, with genuine white samegawa ray skin and black silk cord tightly wrapped. The tsuba (guard) is made of fine finished alloy. 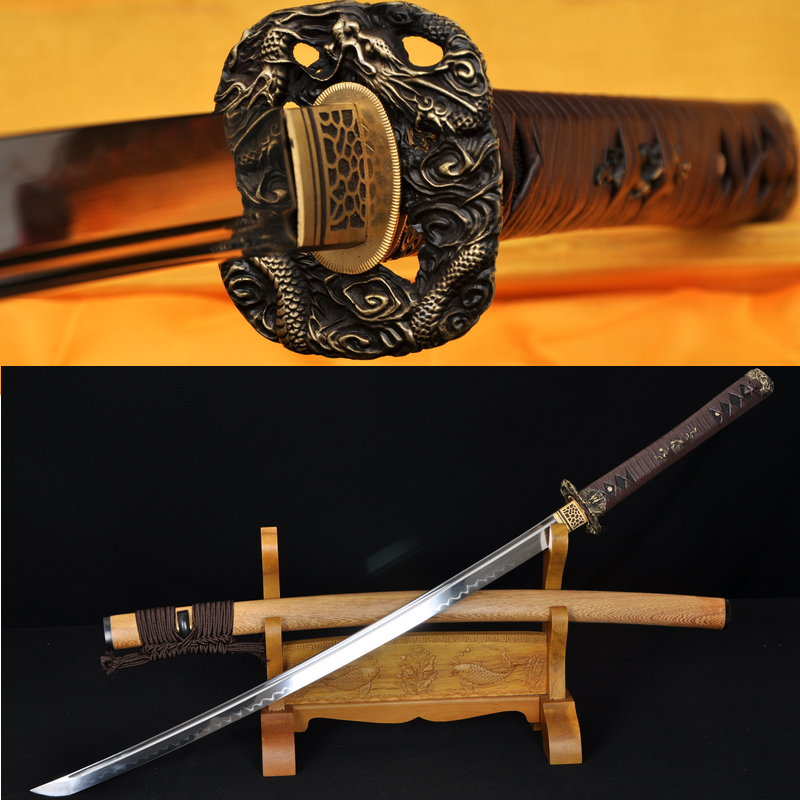 The saya of the sword is hard wooden with a green high gloss finish and bull horn koiguchi. This s..